Natural stone statement pieces can add just the right touch to almost any setting, albeit they come with a price: they are expensive and heavy and can be awkward to maneuver. Dale Mitchell with hardscape design and installation firm Mitchell Landscapes of Greensboro, North Carolina knows this all too well. Dale and his crew are no strangers to the positive and negative aspects of natural stone, but when he was asked to incorporate GFRC, or Glass Fiber Reinforced Concrete, into an outdoor project he was entering foreign territory. He turned to the local concrete experts at Turning Point Innovations, who recommended SureCrete Design Products Xtreme Series GFRC System. 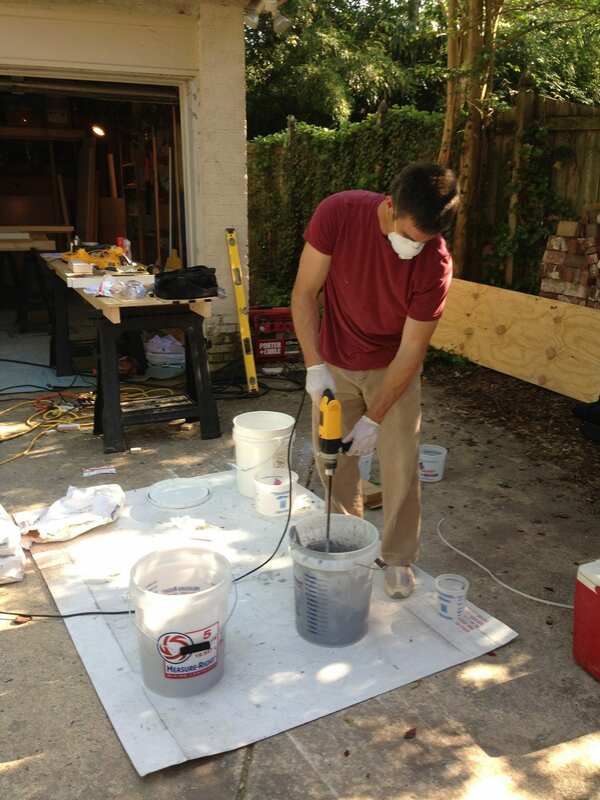 In only about 45 minutes, he received an introduction to GFRC, got a GFRC training manual, and was quickly on his way with the appropriate amount of products to finish the project. The outdoor installation was an entertaining area that consisted of brick-based structures including: two benches, a side bar, and a fire pit. 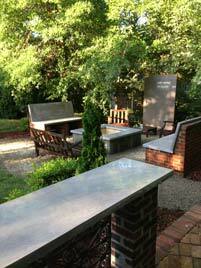 A large steel privacy screen completed the area and will eventually rust and blend with the brick. The Mitchell Landscape crew was to make custom concrete benches, countertops for the side bar, and concrete fire pit that would blend with the organic nature of the area. They started with setting up the on-site staging area, which the customer reluctantly permitted to be set up in half of his garage, with disposable drop clothes. 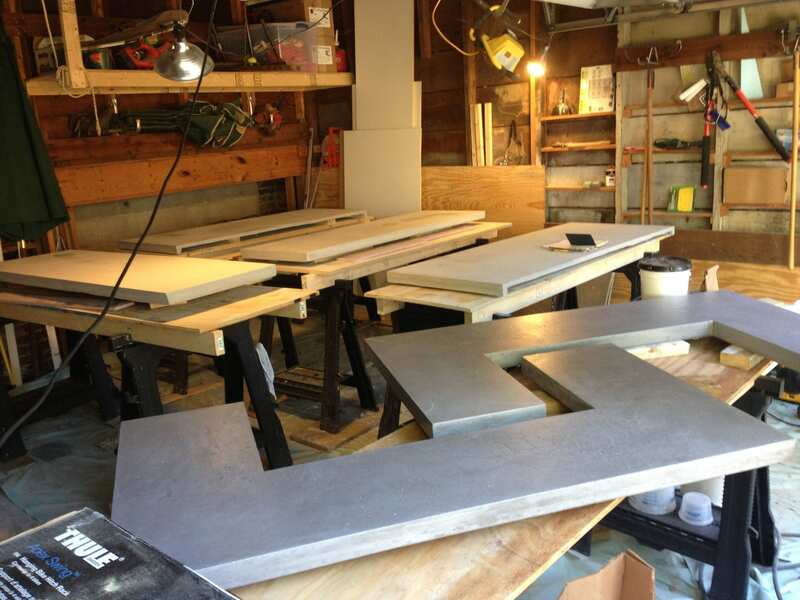 Work tables were topped with high quality melamine (Dale highly recommends this and each board was used twice) so the resulting concrete tops would have a smooth finish. With that, the crew was ready for their first experience with the Xtreme Series GFRC PreCast Mix. They added integral color packs to the mix and poured it into the form with the idea of giving the material a natural stone appearance. The tops were formed to have 2” profiles but, with the use of foam backing placed atop the poured concrete, the middle was kept at only 1” thick. The moment of truth…would the little instruction Dale received on a material he had never worked with be enough to guide him to outstanding concrete tops? The Mitchell Landscape crew was a bit apprehensive, but after just the first pull they were thrilled with the results! In fact, all the pours turned out just as desired…if not better…and little material was left over. 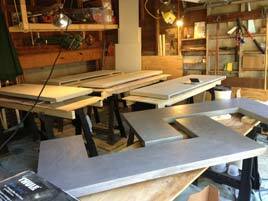 SureCrete’s matte finish sealer XS-327 Hybrid Water Based Polyurethane was recommended. It is specifically designed for PreCast concrete is highly durable and protects against UV damage. After a week of work with GFRC, the clean-up was easy…they just gathered up the drop cloths and blew out the remaining dust from the garage. The customer was happy with his clean garage but ecstatic with his completed outdoor entertaining area. Dale and his crew look forward to marrying SureCrete Design Products with natural stone features in future projects and are proud to be able to offer a cost effective alternative to natural stone that still has an organic appearance. For more information check out www.MitchellLandscpes.com.